On a small planet plagued by a myriad of life-threatening problems, it’s time to choose between truth and myth, superstition and wisdom, life and death. Either you believe in truth, justice, and knowledge, or you let ghosts, spirits, and superstition guide you. Observable truths are the only basis for the necessary social change to bring about ecological sustainability and equitable justice. As long as we believe in ghosts in the sky more than the ecosystems that nurture us, there is no hope. There are way too many false prophets, claiming absolute truth and being used for false profits. God pollution has decimated humanity, society, and ecology for millennia. Organized religions’ superstition and belief in ghosts limit the human family’s ability to come together to sustain global ecology. It is better to live a life based upon doing what is observably right and good, and go to hell, than to waste a life following the edicts of invisible, nonexistent gods. GOD POLLUTION has decimated humanity, society, and ecology for millennia. Superstition and belief in ghosts hold back human advancement. Belief in mythical, god ghosts in the sky is malarkey, the worst sort of mind pollution ever. Yet such irrational thought has become firmly entrenched in society and the body politic, with tremendous deleterious effects. I am told religion is love. Yet, the crusades, the Inquisition, European colonialism under the cross, slave trades, islamo-fascism, and millennia of religious wars don’t seem to have been so full of love. Those who believe in various flavors of god have been at war for centuries, over who most fanatically believes in their invisible ghost and all-knowing book. Organized religion is organized delusional superstition devoid of fact and real truthful love. Superstition has been the basis for much evil and ecosystem destruction and will never be the basis for ecological sustainability. Edicts to go forth and multiply, and to subdue nature and nonbelievers, have left a shameful legacy of genocide and ecocide. Even in this age of modernity and glittering technology, religious extremism of every type thrust upon the public sphere continues to be one of the gravest threats facing human well-being, advancement, sustainability, rights, liberty, and free thinking. The amount of credence and power given to unknowable faith by organized religion – at the expense of observable science and other truths – in governing society is truly shocking. Medieval fairy tale beliefs in invisible ghosts have no place in governance or policy-making. These types of illogical, irrational god myths are largely responsible for many societal problems, including the current state of perma-war, abject poverty, and global ecosystem collapse. It is time that nonbelievers demand that superstitious people keep their god myths off of our bodies, out of our government, and treading lightly upon Earth – retaining them (if at all) as personal spirituality. And stop denigrating – and even killing – those who have shrugged off the mental slavery of mindless faith and don’t believe in your threadworn, bloody myths. One can believe in spirit, truth, and life – living in faith and grace – while rejecting absent god myths sold by corrupted and outdated organized religions. The myth of human superiority and the division caused by the belief in multiple “gods” have brought the Earth, her peoples, and all species to their knees. We must embrace the truths before us that are vital for our survival and well-being. There are no nations, we are one human family, god is a myth, and Earth is alive and dying. And all humans have inalienable rights and sacred duties to live justly and sustainably. Truth and wisdom matter. Having an opinion – particularly drawn from a book of dubious origins, full of contradictory statements – is not the same as education, knowledge, and wisdom. Much loudly spoken ignorance is the result of superstition, limited experience, and a brainwashed disregard for truth. Truths exist and are being ignored, for instance: that we need clean water to survive, that land can only support so many people, that we are all one human species, and that there are no invisible ghosts in the sky ruling over us. All we have is each other, kindred species, ecosystems, and the biosphere. Humanity is one species – separated by national, religious, and class lies, yet utterly dependent upon each other, on kindred species, and on our shared ecosystem habitats for a continued decent existence. If we don’t embrace such ecological truths and abandon superstition as the basis for living our lives, human and all being will end. Look around you at the trees, animals, sky, and land; this is what there is to observable reality. You already exist in a paradise and don’t have to put off pleasure. Embrace the here and now of ecology that surrounds and nurtures us, to which our bodies return upon death. God myths are dead and have no place in the movement to sustain ecology. Ecological sustainability – and a just, equitable world – will not come from superstitious zealots for organized religion. No climate, ecological, or social justice answers will come from such medieval, conflicting, and unknowable myths and superstitions. Sustaining ecology requires a fresh way of thinking that stresses trained intuition, science, wisdom, and love for the human family and all life, while deeply valuing education, observation, and experience of many types. Commit yourself to Earth, truth, knowledge, wisdom, logic, rationality, justice, equity, rights, and duties now in order that humanity, all creatures, and Earth may survive and thrive together. This rejection of organized religion does not mean one should be blinded to spiritual awe and to ritual that binds us to the Earth and the universe’s mysteries. Gaia – the Earth System – is godlike and the giver of all life, the mother’s womb from which all life flows, a loving but firm nurturer, that provides as long as her rules (and her children’s duties) are recognized and respected. Gaia is spirituality that matters, because it is based upon truthful observation, not ancient and irrelevant god myths. Worshiping Earth and her life speaks to the challenges of ecocide, collapsing ecosystems, justice and equity, and truthfully sustaining global ecology, her peoples, and all life based upon what is observably evident. Ecology is the ultimate truth. Without intact natural ecosystems there can be no life. Humanity is destroying natural life for fleeting comfort for some. It cannot last long. Either the human family changes – rejecting god myths for truthful knowledge – or ecology collapses and we all needlessly die in a final apocalypse. The god-freaks’ self-fulfilling prophecy will have come true, but I can assure you the only heaven is the Earth that will have been lost. 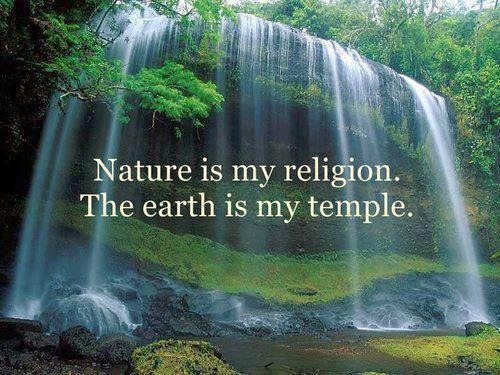 Nature is my religion, Earth is my temple. Economics, religion, and nationalism are utter nonsense, and their teachings and organizations are destroying the ecological basis of being. Organized religion, nanny government, and authoritarian corporatism together combine to enslave humanity in abusive hierarchical structures, leading to overexploitation and even murder of other people, species, ecosystems, and the Earth for profit, god, and country. Islamo- and Christo-fascists try to out-crazy each other. Christo-fascists lack none of the craziness of their Islamo-fascist counterparts, and are no less loony and dangerous, equally ready to murder for their false god. Indeed, right-wing nut-job Christians are much the greater threat to Earth and all peoples as they have nukes, money, and power over resources to utterly destroy being. In fact, Earth’s destruction is their goal as they fully expect to leave this tawdry world of their own making and be whisked away to paradise. There will never be long-term ecological sustainability – or universal justice, equity, and rights – as long as corporatists, churches, nanny governments, and their media hold power. An economic system based upon infinite growth in a finite world can only spectacularly collapse. Despite being brainwashed to worship mythical ghosts and indoctrinated to salute authoritarian power, people have no excuse for ecocide, fascism, or stupidity. In god’s name much evil is promulgated. Destroying ecosystems for “development” is evil. Standing armies to better wage perma-war are evil. Industrial speculative capitalism that commodifies nature and humanity is evil. Lack of global rights, justice, and equity is evil too. Why are we tolerating evil? Could it be that millennia-long proselytizing by zealots for personal gain has brainedwashed us to call hate love, war peace, and evil god? The history of god fairy tales is the history of ecocide, injustice, and war. God pollution destroys ecology and all that is natural, decent, and good. Conflicting and militant superstitious myths undermine truth and threaten us all. There is no god, and god pollution must be resisted if we are to survive. Those who don’t believe superstitious god myths have every right to speak up – at least as much as those promoting a plethora of god myths – as we watch the damage done to ecology, truth, peace, and society by adherence to unknowable fairy tales in an age of science and ecocide. You can never know my dismay and outrage as society and governments – with innumerable social and ecology crises threatening the very existence of us all – are run by mythical edicts from absent gods rather than by truth, logic, wisdom, and knowledge. There can be no human progress or even survival from ecocide if the bastardized words of mythical ancient carpenters and warlords are all we have to go on. Militant belief and public proselytizing on behalf of competing invisible gods and other nonsensical fairy tales are stopping humanity from urgently responding to clearly visible deterioration and looming collapse of global ecology and society. Muslim, Hindu, Jewish, and Christian fanatics lead mirror-image intolerant, superstitious, and truthless lives based upon false messiahs, failed dogma, a mythical afterlife, religious wars, and other deadly lies that are killing Earth and all life right before our eyes in the here and now. We need to stop quibbling about whose invisible god is better and focus upon rational solutions to observed decline in the physical reality surrounding and nurturing us, which is collapsing and dying. Our path to future well-being is simple, and rather than waiting for invisible ghosts in the sky to respond to our prayers, it focuses upon expecting more from ourselves. We must learn to rekindle connections to ecosystems, kindred life, each other, and nature, and in so doing to sustain being essentially forever. The power is within each of us to transform ourselves and our shared reality, in the here and now, for the better, based upon what is observably good and true. Believe in truth and ecology; distrust partisan politics, corporations, organized religion, and the urge for more stuff; and educate and trust in yourself as well. Learn to identify observable threats from antiquated parables. Trust in radical freedom as long as one is not hurting oneself, others, or the Earth. Embrace obvious, scientifically validated truths such as this: together we either stop cutting old-growth forest ecosystems and burning fossil fuels or face final apocalyptic death. Fairy tales don’t make good ecological policy. Toxic god pollution has a shameful history of killing all with which it comes in contact. Given their scurrilous, predatory, and ecocidal histories, religions including Christianity, Islam, and Judaism offer no basis for justly sustaining ecology. A few green initiatives here and there, after millennia of natural desecration, do not redeem ecocidal faith. Declare yourself free from religion. Insist that the god-deluded please keep their Abrahamic god mythology to themselves. The key to living a good, truthful life is to think freely, resist indoctrination, unlearn myths and untruths, find your own road, and be about big, truthful ideas larger than yourself. And focus upon loving and defending Earth, the most observable and evident godlike being. Beliefs in invisible, mythical gods are fundamentally incompatible with achieving a just, truthful, fair, and ecologically sustainable world. Such superstitious fairy tales serve only to lead humans, like lambs, to their unreasoned slaughter. The issue is the corrosive role of organized religion upon society and ecology, not individual personal faith practiced in the privacy of one’s home. Believe whatever you want personally. But again, I insist that you please keep your god out of government, treading lightly upon Earth, and off of and out of nonbelievers’ bodies. Then all is fine. I am not sure where we go when we die, yet I am unable and unwilling to accept millennial tales handed down without a shred of evidence to me by those with obvious conflicts of interest. Like fairies, religious belief is comforting and fun to think about for some, yet both are clearly myths. And untruthful myths stop us from focusing upon the here-and-now, observable world before us, which is in great need of reason-based social change. There is nothing I hate more than being proselytized to by ignorant, small-minded, and superstitious people about ghosts in the sky – whom we can live with, if we follow their dogma. How stupid do you think we are? Geez, get a grip. If superstitious religious people put half as much thought into caring for the world before our very eyes as they do about a mythical afterlife, everything – particularly global rights, ecology, and fairness – would be much improved. Mythical gods can’t save ecology, celebrities aren’t able, and the oil oligarchy’s governments won’t. It is up to you and me to save being, based upon a reasoned sense of self-enlightenment. It is time to think freely to solve our problems with an open mind, unfettered by myth, or we are all going to die needlessly as ecology collapses. Above all else, commit to truth – of all types, particularly Earth truth – as the only just and equitable basis to sustain ecology and universal well-being. Free, truthful thinking enmeshed within ecology’s warm embrace is the answer. Achieving global ecological sustainability and rights for all living beings will require a sense of rationality and respect for knowledge that is lacking. Throw off indoctrination, mind control, and superstition; and instead THINK FREELY. And commit to large important ideas like Earth, equity, justice, and other self-evident truths. Together we can make it so. Only then will humanity live forever in an Earthly paradise. Thank you for expressing my likeminded sentiments so well.